ezDRoster - Free employee scheduling software ~ Android Forever! "No matter what your business or organization - nurse staffing, medical staff, hotel and hospitality , restaurant, academic institution, delivery services, cleaning and maintenance personnel, trainees, help desk employees, transportation services, flight attendants, real estate, travel agency, retailer, convenience store, construction, volunteers organization - You need to run your business smoothly, efficiently. Another DRoster benefit: DRoster uses a non-proprietary Firebird database. This means you can integrate all your scheduling data with your payroll software or any other data source. Seamless integration gives you an accurate up-to-the-minute picture of your human resources as well as total control of your workforce for crucial instant response. 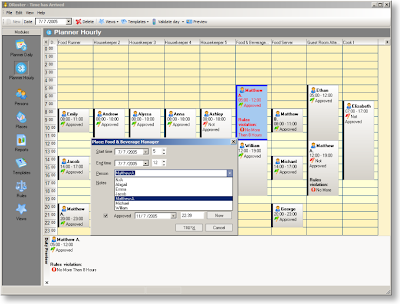 DRoster staff scheduling software is easy to install and use. Upgrade to DRoster's automated, computerized staff scheduling rostering solution today at no cost. It's about time you got your free fully functional copy of DRoster employee scheduling software."